In a city that is ever evolving, with pod sized bedrooms, shabby chic and urban/industrial design it is difficult sometimes to find somewhere that you can guarantee luxury and indeed high quality design and facilities. Hence forth the Grand Hyatt. I am no stranger to a Hyatt, I have seen many of them globally and I can tell you here what they all have in common…. Everything. It is like you know and can rely on the standards as they are consistent through all of their hotels. Now, far be it for me to deny those of you who like your rooms with industrial metal floors, a bed shaped like an egg or perfect zen minimalism… However, you will not find it here. Because this hotel is far more concerned with high quality comforts that make guests feel as if all their needs have been considered, than it is with a bed made out of pipecleaners and biodegradeable egg boxes. My personal favourite additions are both the walk in wet-room bathrooms and also the televisions in the bathroom. You know, sometimes I don’t want to have to strain my neck while drying my hair to see what is happening in Jurassic Park and luckily… here, I don’t have to. Here is a case of feeling at home, (al beit a very well decorated home) away from home and feeling as if you are able to really relax with absolute guarantee of great service. Particular guest favourites within the hotel are the Maybach suite and the Daimler suite. That said, as is the Hyatt consistency that should you book a standard room or a suite, your levels of service and comfort from the hotel will be the same. Should you go for a suite then their famous Executive Grand Club™ lounge is a definite winner in my book. The hotel has 3 restaurants. The Tizian Lounge (International cuisine in cosy lounge ambiance), Mesa (Traditional German cuisine to share in relaxed atmosphere) and finally Vox. Vox is my choice for great cocktails, a lively atmosphere and high calibre food. It has Creative dishes and fresh sushi for gourmet enthusiasts and truthfully, it was really lively on a Saturday night. Not to mention, their whiskey collection is INSANE. 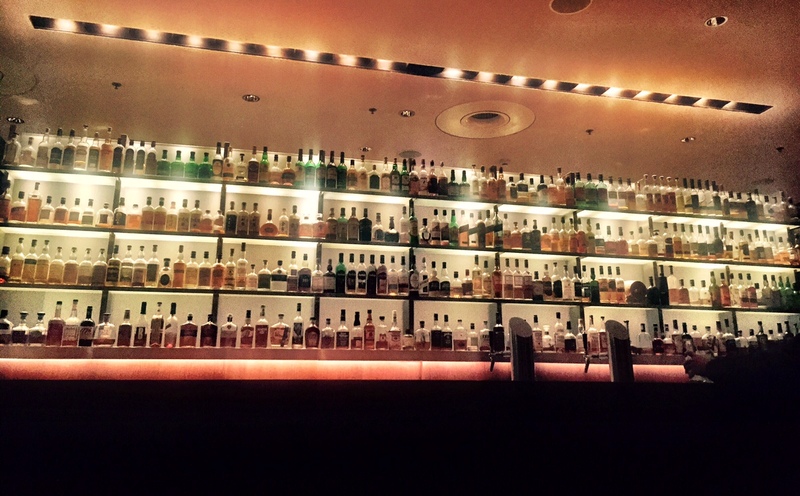 300 different kinds of whisky is just not normal. Vox Bar has one of the largest selections of whisky in Germany including a Strathisla from 1955, an Ardbeg Provence 1974 and a 30-year-old Laphroiag. They also have Canadian, blended Scotch, single malts, Irish, Bourbons and Rye, Japanese malt Suntory Yamazaki. Basically to save a very long list… what every you like, you’ve covered. If you visit the Club Olympus Spa, you will be greeted with a cracking (and very relaxing) view overlooking the rooftops of the Mitte district. They have a long list of treatments and services inspired by the healing traditions of the Far East. Should you not want to get your exorcise by exploring Berlin (which is vast in terms of its different districts) then they have a high tech gym also so you can get your “HIT workout” on while gazing over the city. Sometimes the Hyatt can be seen as somewhere that the wealthy business set favour, but with the addition of Vox and their cracking spa, it also had a young and well turned out clientele with a lot of young buzz about the place. The Grand Hyatt Berlin is near to the very busy city centre and close to some of the cities best restaurants, memorials, the Berlin Mall and the 18th-century Brandenberg Gate /Brandenburger Tor. If you know Berlin you will know that almost no touristy sight is near the other so to have quite a few in near proximity is a huge plus. The fabulous service with a smile is just the icing on the cake.